Rover a dog of medium brain is, ‘owned’ by Barry. Barry is a Buddhist and all his friends are of the same persuasion; meeting each Thursday in Barry’s living-room to meditate together and speak afterwards of lofty metaphysics. Rover listens in on all of this and agrees with everything they say, he is even pretty good at anticipating their conclusions, frequently long before they plod their way to the end. Every evening at seven o’clock Barry meditates in the living-room, allowing him time to catch his favourite programmes on the tv. When he is meditating, Rover is not allowed in the room since Barry claims that Rover distracts him and so he lies in the kitchen watching Barry through the open door. Barry is emptying his mind, and Rover cannot understand what all the fuss is about. ‘Why does he have to sit just there to do it,’ he thinks. Rover has no trouble emptying his mind, in fact he does it all the time. He lowers his body to the kitchen floor, rolls onto his side and with one eye on Barry, empties his mind. A half an hour later Barry’s alarm clock goes off and he springs to his feet, switches on the television and puts his feet up on the couch. He goes over to Barry’s meditation spot against the wall and sits down in as near an imitation of his friend’s posture as he can. He allows himself to become very still and slowly empties his mind. Barry meanwhile is immersed in a sit-com, the tiny figures flicker on the screen and such is his preoccupation that it is a little while before some strange element in the atmosphere distracts him. There is an unnatural stillness in the room and he looks nervously around. His eye falls upon Rover who sits like a stone basilisk against the wall. 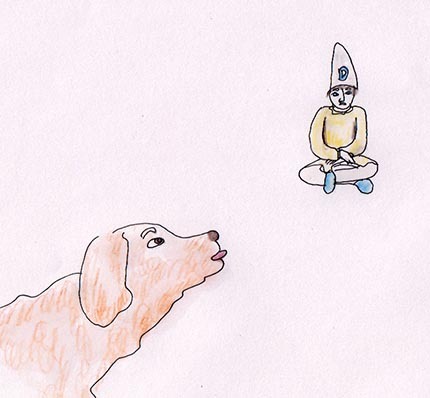 He watches him for a while but the dog, staring straight ahead, does not move a muscle. Barry is a little unnerved by this and a shiver of apprehension runs through him. ‘Rover,’ he says, but from the dog there is no response. ‘Rover,’ he says again, but still the dog sits unmoving and, since he has emptied his mind, undistracted. Now Barry is shouting. ‘Rover, what are you doing? Come over here.’ But Rover, ascending the heights to his own canine Nirvana has gone well beyond. Barry is getting angry; pulling himself heavily from the couch he strides over to where Rover sits at peace with the world, and, taking him by the scruff of his neck gives him a good shaking. Rover seems very matter-of-fact about this treatment; he gets up when Barry has released him and, leaving the room, goes out into the kitchen where he drinks some water from his bowl. ‘You just have to empty your mind,’ says Rover. The mongrel looks puzzled and the other dogs don’t seem to know what he is talking about, so he begins to explain. Weaving a long chain of metaphysical reasoning, he regurgitates the long dialogues between Barry and his friends and, with a final brilliant flourish, brings his much embellished discourse to a close. The dogs are much impressed with this. They have hardly understood a word but now seem to regard him as some kind of expert on a subject that they can but dimly perceive. Rover likes this and begins to pile it on, puffing himself up and talking in a lofty manner. The other dog’s respect deepens with this impressive behaviour; they begin to adopt a servile manner and Rover is over the moon. Now he realises his role in life; his disciples will be as numerous as the leaves in Autumn. The other dogs begin to approach him with elementary questions which he answers in a lofty and definitely “holier than thou” manner. The more the dogs respect him, the more regal he becomes, and soon a small coterie of disciples form an inner-circle around him to bring some order to the situation. Now when someone has a question they must apply to his protectors and, when finally granted an audience, must ask their question in the correct manner. Rover answers these simple questions easily and his reputation is growing fast, tinged now with more than a suggestions of holiness, until one day while he sits in front of his gate and a large group of his admiring disciples sit in a semi-circle around him, a white van pulls up outside his house. Barry has ordered a new stereo, but of this Rover has no idea. A man steps out of the driving cab and slams shut the door with and angry oath. In his arms he carries a large parcel and he staggers a little under the weight. He is dressed in rough workman’s clothes and doesn’t look too happy. As he reaches the gate he finds his way blocked by Rover who, having risen to such exalted heights and fearing that such an action might bring loss of dignity, disdains to move. ‘Get out of the way,’ shouts the man furiously and kicks the Nobly Born One aside with his boot. Rover doesn’t go out much anymore. This entry was posted on 23 September, 2014 in homepage and tagged buddha dog, dave tomlin, holy dog, Meditation, nick victor, short story, spiritual puzzle. Bookmark the permalink. Being without hope he is always cheerful. Without ambition…a man to follow. Having no destination he has arrived. Wise words from the beyond.